Spider-Man: Turf Wars Release Date, Suits and Trailer Revealed | Nerd Much? Insomniac’s 2nd DLC pack for Spider-Man is nearly upon us. The studio announced the Spider-Man: Turf Wars release date today to confirm as much. But they also showcased the new suits that will be included and a teaser trailer to whet our appetites for what’s to come. If you haven’t finished the base game or completed the Spider-Man: The Heist DLC that released last month, you’ll probably want to do so before continuing on or watching the above trailer. The narrative continues on from the events of both so you likely don’t want to spoil yourself. Just like last time, Turf Wars will introduce new story missions, bases to take down, street crimes to thwart, challenges and trophies. Oh, and new suits! Insomniac’s new trio all have comic origins, the most iconic of which is likely the classic Iron Spider suit that the new iteration from the Marvel Cinematic Universe was inspired by. Also added is the all black Spider-Armor MK1. 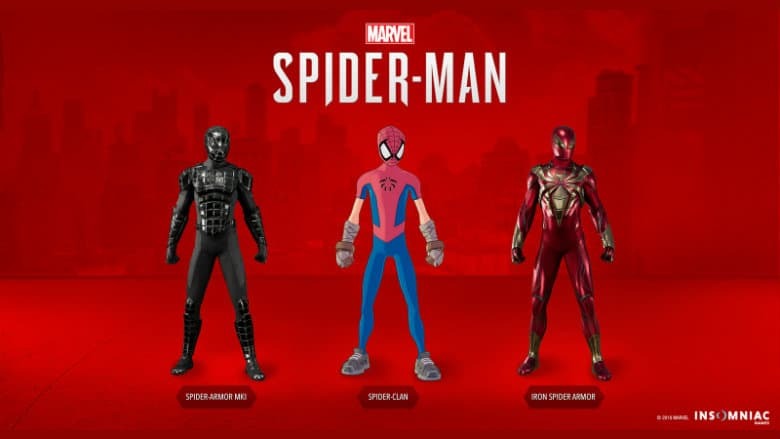 And Insomniac also added a new cel-shaded costume into the mix with the Spider-Clan suit which is pulled directly from the Marvel Mangaverse comics. Insomniac seems to be right on schedule for their DLC drops. The Spider-Man: Turf Wars release date is set for November 20th, almost exactly a month following The Heist’s launch. The 3rd Spider-Man DLC, Silver Lining, is tentatively scheduled for sometime in December.